Decisions, actions, and beliefs from our past can have a powerful influence on our present life. This powerful audiocassette discusses how to release the effects of trauma from childhood and past life, as well as spiritual ways to undo the effect of self-destructive behavior such as cigarette smoking or drug taking. Doreen discusses "time collapse" methods, which allow listeners to release their cellular memories of past-life pain and traumas. She talks about how vows of poverty, celibacy, and suffering made in prior lives can follow us into this life. Doreen also guides listeners through the severance of such vows. When traditional talking therapy fails to yield desirable results, past-life issues may be the culprit. This tape does a deep cleansing of multiple issues from multiple past lives. It also heals childhood and early adulthood wounds from this life, including sexual traumas, addictions, relationship hurts, and business challenges. Whether or not you believe in past lives, there are very real therapeutic benefits from undergoing a past-life regression session. 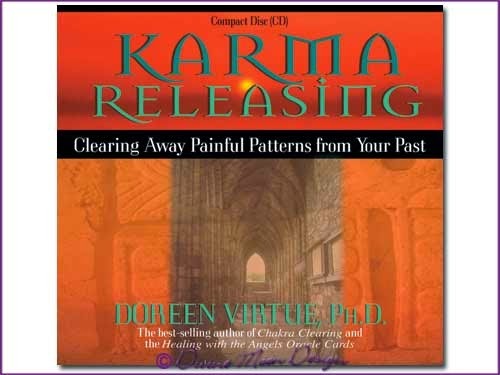 In this enlightening audio CD, Doreen Virtue, Ph.D., discusses how her clients have healed from phobias, addictions, and mood disorders by recalling their past lives. She also talks about how our past lives give us important clues about the Divine life purpose of our present life. Doreen reminds us that with the help of our guardian angels, we can discern important information about our past lives in a safe and gentle manner. Doreen and your angels also help you to unwind and relax so that your unconscious mind will reveal its ancient secrets. Accompanied by your angels and the beautiful music of Steven Halpern, you'll travel back in time and recover your past-life gifts. This powerful meditation and discussion CD guides listeners through a "progression" (similar to a regression, except you see your future instead of your past). Doreen discusses "parallel realities," and how the angels show you — in the progression — your highest alternative reality. Then, she helps listeners to work with the angels to manifest this highest reality. Doreen discusses how our life's purpose is fulfilled in our highest reality, and how the angels seek to support us while we fulfill our life's purpose. Everything we need to complete our mission is available to us right now, and the angels help us to manifest this supply. In addition, Doreen discusses and then takes listeners through the steps of purposeful manifestation and talks about four common pitfalls that can block manifestations and how to avoid them.